ALLIGATOR CAPITAL OF THE WORLD. Located between Orlando and Kissimmee on the South Orange Blossom Trail, Gatorland is one of Central Florida’s classic attractions, and provides a unique and natural alternative to the larger theme parks of today. 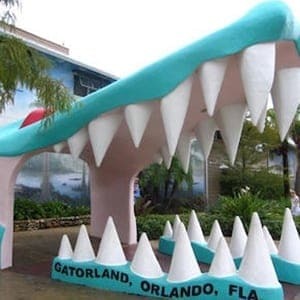 Founded by the late Owen Godwin in 1949, and still privately owned by his family today, Gatorland is a 110-acre theme park and wildlife preserve, combining “Old Florida” charm with exciting, new exhibits and entertainment, making it Orlando’s best half day attraction®. Get up-close and personal with gators, crocs, birds, turtles, zebu, deer and much more! 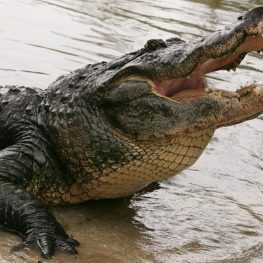 Enjoy one-of-a kind shows like the ” ALLIGATOR – LEGENDS OF THE SWAMP”! 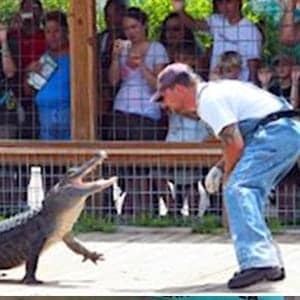 Cheer on the stars of the famous Gator Jumparoo as they jump 4 to 5 feet out of the water. Then head on over to the Up-Close Encounters Show where you can expect to find the unexpected! No cameras, cell phones, video equipment including GoPro cameras and other personal items may not be taken on your adventure. Secure lockers will be available for storing your belongings. Guests will be required to sign the Zipline Waiver. Use the link to fill out online. Cancellations: 48 hours in advance required for a refund on your zip line reservation. If you need to change your launch date or time, please contact Gatorland a minimum of 24 hours prior. If your launch is canceled due to inclement weather, a rain check will be issued for a future launch within one year from the date of your originally scheduled visit.